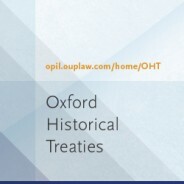 Oxford Historical Treaties is the premier resource for historical treaty research and home to the full text of The Consolidated Treaty Series, the only comprehensive collection of treaties of all nations concluded from 1648 through 1919. In April 1822, sailors from the British warships HMS Iphigenia and HMS Myrmidon, after a brief but fierce fight, captured two Spanish and three French slave ships off the coast of what is now Nigeria. Prize crews sailed the ships to Freetown in Sierra Leone, where the international mixed commission which was competent to hear cases regarding the slave trade decided to liberate the slaves found on the Spanish schooners, as well as those slaves found on a Portuguese ship which the British naval vessels had taken earlier. With this story, the American international lawyer Jenny Martinez opens her book on the abolition of the slave trade in the 19th century, The Slave Trade and the Origins of International Human Rights Law. The actions of the British navy to fight the international, and particularly the Atlantic, slave trade, the establishment of mixed commissions, and the ensuing liberation of almost 80,000 slaves by those international tribunals were pursuant to a growing web of treaties which prohibited the international slave trade, and eventually slavery itself. In this development, the Vienna Congress of 1814–1815 played a seminal role. Among the treaties which were produced at Vienna was the Declaration of the Eight Courts Relative to the Universal Abolition of the Slave Trade of 8 February 1815 (63 CTS 473). The Declaration was signed by the seven leading powers of the anti-Napoleonic coalition – Austria, Britain, Prussia, Russia, Portugal, Spain, and Sweden – as well as France. The Declaration was an achievement of British diplomacy, and of its major representative at Vienna, Robert Stewart, Lord Castlereagh (1769–1822). If, during the early 19th century, Britain had become the champion among European States for the abolition of the slave trade, this was largely the merit of a movement which sprang from civil society. During the final decades of the 18th century, Britain, as well as the American colonies, saw the emergence of a strong and vocal movement that strove for the abolition of slavery. This movement, which was also driven by economic motives and inspired by sensitivities about human dignity flowing from the Enlightenment, had its strongest roots in radical, puritan Protestant circles. After having scored a major success before the courts in Somerset v. Stewart in 1772 (98 English Reports 499), wherein the holding of slaves on English soil was banned, the abolition movement turned its guns against the international slave trade. After Parliament had rejected several proposals to enact legislation to that extent, the fortunes of the movement changed when it allied its cause to the war effort against France and targeted the French slave trade. In 1806, Parliament passed the Foreign Slave Trade Act (46 Geo. 3, c. 52 (Eng. )), which forbade British subjects to trade in slaves with France or its allies. A year later, the Act for the Abolition of the Slave Trade (47 Geo. 3, c. 36 (Eng.)) expanded the prohibition to the slave trade as a whole. During the Napoleonic wars and the War of 1812 against the United States, the British navy used its rights under the laws of war and neutrality to act against enemy and neutral vessels to stop the slave trade. As this occurred in contravention to established neutrality law and carried dangers for the relations with different neutral countries, British diplomacy endeavoured to conclude bilateral treaties with other powers whereby these powers accepted partial restrictions against trade in certain geographical areas, as in the treaties with Portugal of Rio de Janeiro of 19 February 1810 (61 CTS 41-1) and of Vienna of 21 January 1815 (63 CTS 453). The prospect of peace, however, forced the antislavery movement to change tack. The First Paris Peace Treaty of 30 May 1814 (63 CTS 171) between the allies and France made this painfully clear. In one of the separate articles, concluded between Britain and France, it was stipulated that France would join Britain in its endeavour to attain a universal prohibition of the slave trade. The same article, however, made allowances for the French to wait for the enactment of national legislation to quell the slave trade for five more years, which in practical terms meant a step back from what Britain had been doing against the French slave trade during the war. This clause triggered a massive campaign within Britain which helped to force the hand of British diplomacy to push the issue at Vienna. The British followed a dual strategy. On the one hand, they tried to move towards a general, multilateral convention against the slave trade. This proved to be particularly difficult because of French resistance. 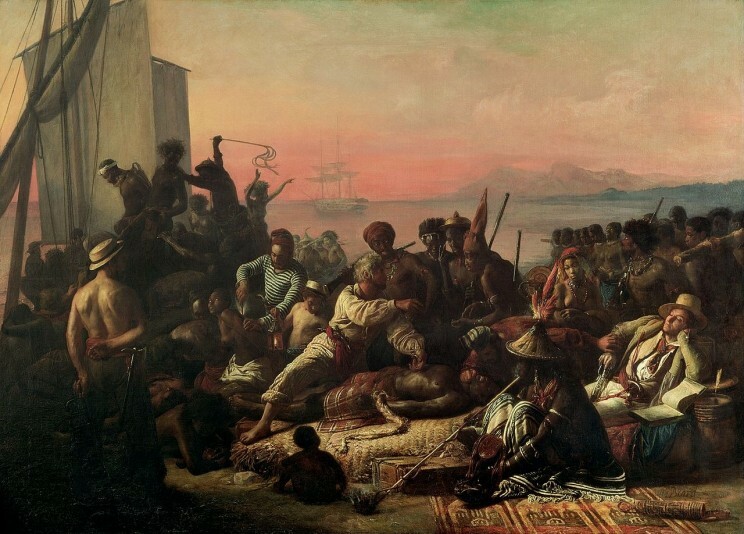 On the other hand, success was attained by including prohibitions of the slave trade in bilateral treaties with other countries, including – apart from Portugal – the Netherlands and the US. In the face of French resistance, the British failed to attain an immediate, general prohibition of the slave trade. But on 8 February 1815 the eight leading powers did sign a Declaration which condemned the slave trade as ‘repugnant to the principles of humanity and universal morality’, making direct reference to public outcry against it in ‘all civilised nations’. Regardless of this strong language, the Declaration remained more at the level of expressing a lofty cause than imposing concrete obligations, except for the commitment to start negotiations about general abolition. Although the abolition movement felt a lot of disappointment over this result, in the most ironic of ways it served to clear a major obstacle towards general abolition. After Napoleon reassumed power upon his escape from Elba in March 1815, he moved to abolish the slave trade in order to placate the Vienna Congress. Whereas no general treaty of abolition of the slave trade materialised after Vienna, over the next decades many States moved to enact abolition through national legislation. As a more direct result of the Vienna regulation, in 1817 Britain succeeded in concluding several bilateral treaties, by which mixed commissions were set up to deal with slave trade issues. It was under these latter two treaties that the Freetown mixed commission operated in the above-mentioned case of 1822. On 20 December 1841, the five great powers of Europe concluded a treaty whereby they committed themselves to promote the abolition of slave trade and recognised a right to stop and search each other’s merchant vessels in certain waters in order to enforce it (92 CTS 437). The Vienna Declaration has been rightly credited with having introduced abolition of the slave trade as a principle in general international law. As such, it became an inspiration and point of reference for the fight for general abolition. Randall Lesaffer, Professor of Legal History at Tilburg Law School, is the Editor of Oxford Historical Treaties. His research focuses on the historical and recent development of the international legal order.